Understanding the mechanisms involved in the turbulent transition of boundary layers is crucial for many engineering domains. They are mainly studied by analytical theories supplemented by direct numerical simulations (DNS) of the entire flow dynamics. Such simulations require high-order approximations, such as the spectral methods that have been successfully used for fundamental studies on periodic channel flows and free-stream boundary layers since the 70s. 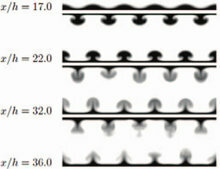 This work focuses on the flow transition from laminar to turbulent at the entrance of a plane channel. The transition is essentially similar in that case to what happens to a boundary layer under an accelerated free-stream. At lower Reynolds numbers, the interaction of the boundary layers plays a more complex role on the nature and location of the transition. These aspects have been explored with a parametric study for varying Reynolds numbers. Since geometries of interest are wide and very elongated, the simulations involve billions of modes, thereby needing massively parallel platforms.